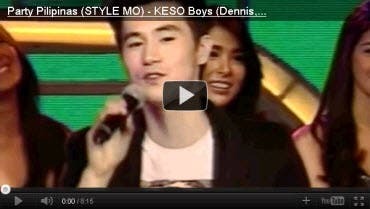 Check out the performance of the KESO Boys in Party Pilipinas "Style Mo" episode (10-16-11). They’re cheesy but they will surely make your heart throbs. Check out Aljur Abrenica, Steven Silva, Derrick Monasterio and Dennis Trillo serenaded the ladies with sentimental love songs in the “Style Mo” episode of Party Pilipinas last Sunday.